It’s at this time of year, everyone within the Scottish music industry starts thinking of the Scottish Album Of The Year Award. It’s without doubt, the most prestigious award in Scottish music. There’s a lot of kudos attached to the Award. Then there’s the £20,ooo cheque the winner is handed. For many Scottish artists, this will be a lifeline. It certainly could help Withered Hand, who took five years to produce his sophomore album Good News. Six long years have passed since Withered Hand recorded their debut album Good News. It was released to critical acclaim, and praised for its stark honesty. There was a reason for this. The man behind Withered Hand, Dan Willson was a latecomer to music. He was already thirty when he wrote his first song. So, Dan had lived a life and had stories to tell. Many of them were based upon his life. This is also the case with Withered Hand’s sophomore album New Gods. New Gods was released on 17th March 2014. With the help of funding from Creative Scotland, Dan was able to record New Gods, the long awaited followup to Good News. It was released via Fortuna POP! in the UK and Europe and Slumberland in the US and Canada. New Gods features more songs based on Dan’s life. That’s been the case since Dan wrote his first song. This came during a period when Dan’s life had been turned upside down. A close friend had just died, and he was about to become a father, for the first time. Dan was reflecting on what life was about. He found himself asking the “big questions.” To help him find answers and express how he was feeling, Dan wrote his first song. For Dan, this proved a cathartic experience. It helped Dan to make sense of what had been happening in his life. This is when Dan realised he was a talented songwriter. Aged thirty, he began writing the songs that became Good News. Rather than release the album as Dan Willson, Dan dawned the persona of Withered Hand. Maybe, it was easier for Dan to write and perform the songs via his alter ego? On Good News’ release, critics on both sides of the Atlantic and musicians like Jarvis Cocker were won over by Good News. Where had Withered Hand all these years? Previously, Dan had been active in the world of visual art. He was interested in music and “dabbled.” However, it wasn’t until he dawned the persona of Withered Hand, that Dan decided to make a career as a musician. Following the release of Good News, Withered Hand has established a reputation as a prolific live performer. That’s no bad thing. It allowed Withered Hand to further hone his sound. This has resulted in Withered Hand establishing a reputation as one of Scotland’s best singer-songwriters. During this period, Withered Hand has continued to win friends and influence people. Among them, are fellow musicians. Many of Withered Hand’s fellow musicians are delighted to share a stage with one of Scotland’s rising musical stars. Recently, this has included Pam Berry, of America noisepop band Black Tambourine. Pam also joins Withered Hand on New Gods, adding backing vocals. Pam isn’t the only guest artist on New Gods. Far from it. For New Gods, Dan penned eleven tracks. These songs deal with the big issues in life. This includes love, death, friendship and infidelity. There’s also songs about road trips, stargazing and cough mixture abuse. New Gods is a grownup album from a perceptive and talented songwriter. That’s why when Withered Hand recorded New Gods, he was joined by some of the biggest names in Scottish music. When the recording of New Gods got underway at Mogwai’s Castle Of Doom Studios, Withered Hand’s band was augmented by a who’s why of Scottish music. Withered Hand’s band includes a rhythm section of bassist Fraser Hughes, drummer Alun Thomas and guitarist Malcolm Benzie. Peter Liddle plays accordion and Pam Berry of Black Tambourine, adds backing vocals and plays tambourine. Other guest artist include Pete Harvey on cello, Andy Robinson on djembe and Rob St. John on mellotron. They were joined by King Creosote, who Dan describes as his mentor. There were also guest appearances from some of Scottish music’s biggest names. Among them were Eugene Kelly of The Vaselines, Stevie Jackson and Chris Geddes of Belle and Sebastian and Scott Hutchison of Frightened Rabbit. Producing New Gods was another legend of Scottish music, Tony Doogan who previously, has produced Mogwai, Teenage Fanclub and Belle and Sebastian. It was this all-star lineup that recorded New Gods, which was funded in a different way to most albums. Making an album is an expensive business, especially without a record company behind you. So, to fund New Gods, Withered Hand turned to Creative Scotland. They’ve previously helped Quickbeam and Blood Relatives to record and release albums. They helped Withered Hand to fund New Gods, which has just been released. Would New Gods be well received? On its release New Gods critics have heaped praise upon New Gods. Just like Withered Hand’s debut, Good News, New Gods has been critically acclaimed. New Gods has been described as the equivalent of a “confessional” that’s variously wistful, joyous and “life-affirming.” That’s some recommendation. New Gods it seems, is one of the best Scottish albums of 2014 so far. Is that the case? That’s what I’ll tell you. Opening New Gods is Horseshoe, which demonstrates Dan’s skill as a singer and songwriter. It’s a poignant and powerful song about fear and loss. Just a lone acoustic guitar accompanies Dan’s vocal. Fear and despair fill his vocal as he sings: “Please don’t put a shadow on her lung.” Accompanying him are distant harmonies, a strident rhythm section, searing guitars and keyboards. The arrangement grows, matching the despair in Dan’s vocal. He unburdens himself, revealing his deepest fears. His vocal is a cathartic outpouring of despair, fear and grief and results in a poignant, powerful and beautiful song. Crystalline and jangling guitars join the rhythm section and harmonies as Black Tambourine unfolds. It’s a slice of perfect pop that’s described as an “anti-hipster anthem.” Think Lloyd Cole and The Commotions circa Rattlesnakes and that’s a fair comparison. Dan even finds his inner rocker, as blistering guitars are unleashed. Mostly, though, it’s the sweetest and purest perfect pop that’s melodic and anthemic. Love Over Desire is a relationship song, sung from the point of view of a musician on the road. It has a much more understated arrangement. It’s just Dan and his trusty acoustic guitar. Gradually, the arrangement builds, with weeping guitars and the rhythm section combining. Later, an organ, cello and backing vocals enter. However, it’s Dan’s lyrics and vocal that grabs your attention.His lyrics paint pictures. They’ve a cinematic quality, and when Dan delivers them, his worldweary vocal brings them to life. Joyously, King of Hollywood bursts into life. Folk and rock combine as Dan twists his way through the song. Accompanied by an accordion, rhythm section and guitars Dan tells the story of a night out in Los Angeles with King Creosote. As Dan reminisces, the accordion helps power this hook-laden opus along. Melodic, memorable and truly infectious describes this song. California is the polar opposite of the previous track. The arrangement is moody and understated. Acoustic guitars accompany Dan’s wistful vocal his time in California, when he experienced its darker side. Dan reminisces, remembering how it all unfolded. It started well, “beer, ice cold, in my hand, I’m on my way” then later; “stopping for a burger in the In-n-Out” and then: “bag of powder,” “heart beating in my chest like a jackhammer.” Meanwhile, the rest of band provide a moody backdrop to Dan vocal, as he remembers what he’d sooner forget. Chiming guitars and the the rhythm section set the scene for Dan on Fall Apart. His vocal is tender and thoughtful, before growing in power. Stabs of piano and harmonies accompany Dan. Memories come flooding back. Sadly, they mean more to him. Dan remembers: “you and I were dancing, by the light of every dead star” and “put your hand in mine, I remember the first time.” These lyrics are part of another anthem that showcases Dan’s talents as a singer and songwriter. Just like the other tracks, his all star band provide the perfect backdrop for his vocal powerhouse. Between True Love and Ruin is another relationship song, but one with a twist in the tale. He loves and needs her, while she’s “dreaming of freedom.” That’s because of her insecurity. Dan sings: “you said when people say nice things to you, you found it hard to believe them.” Horns rasp, while the rhythm section provide the arrangement’s heartbeat. Dan’s vocal is melancholy and needy, as he lays bare his soul, constantly reassuring her: ”don’t you know you had a friend?” This results in a quite beautiful and perceptive song about the nature of relationships. Life Of Doubt is a song about addiction and specifically, being addicted to cough medicine. With a blues harmonica, that’s reminiscent of a Neil Young album setting the scene, one of the most poignant and moving songs unfolds. Just the blues harp and acoustic guitar accompanies Dan’s vocal. His vocal is a mixture of hope, fear and despair. He knows he’s an addict, but doesn’t know if he can or wants to get clean. Bleak, despairing and brutally honest, it’s one of the best songs about addiction I’ve heard in a long time. Heart Heart is a raucous slice of singalong rock-tinged folk. Withered Hand kick loose. It’s as if the spirit of ’76 has inspired them. Rebel rouser in chief is Dan. His vocal is powerful as he helps the rhythm section, guitars and keyboards drive the arrangement along. When the tempo drops, this is a curveball in a track that’s best described as a raucous everyman anthem. Not Alone close New Gods. It’s a wistful and poignant song. The understated arrangement suits the song. This allows Dans’ delivery of the lyrics to take centre-stage. That’s until the braying horns, mellotron and la-la-la harmonies take charge. Soon, the wistfulness is gone, becoming celebratory as if saying goodbye for the final time. “It’s been a long time coming”, so sang Sam Cooke. The same thing can be said about New Gods, Withered Hand’s sophomore album. However, it has been worth every minute of that long wait. New Gods features eleven songs dealing with the big issues in life. This includes love, death, friendship and infidelity. There’s also songs about road trips, stargazing and cough mixture abuse. 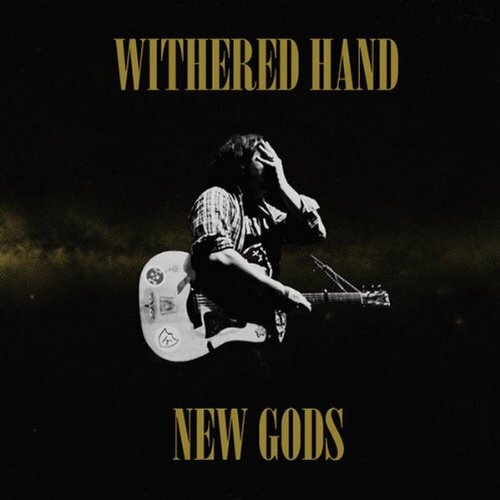 That’s why I’d describe Withered Hand’s sophomore album New Gods is a grownup album from a perceptive and talented songwriter. That was the case with Good News, Withered Hand’s debut album. Released to critical acclaim, Good News followed from Withered Hand. A new album, New Gods, was due out on 17th March 2014 via Fortuna POP! in the UK and Europe and Slumberland in the US and Canada. Dan is one of the most talented and perceptive songwriters around. His songs can make you laugh, cry and dance with joy. From the opening bars of Horseshoe, right through to the closing notes of Not Alone, New Gods is a spellbinding album. That’s why I’d describe it as a cathartic confessional. New Gods veers between wistful, joyous and everything in between. That’s why Withered Hand have a big future. With their unique brand of Americana, blues, country, folk and rock Withered Hand are one of Scotland’s most exciting bands, whose sophomore album New Gods, was one of the best albums of 2014, and would be a worthy winner of the Scottish Album Of The Year Award. ← BAD COMPANY-BAD COMPANY (DELUXE EDITION).